NASA's Upper Atmosphere Research Satellite (UARS) is expected to plunge toward Earth on Friday (Sept. 23). The Federal Aviation Administration issued an alert to pilots today warning flyers to be on the lookout for any signs of a huge NASA satellite expected to fall to Earth tonight (Sept. 23) or early tomorrow. FAA officials released the special notice after NASA refined its estimates for the re-entry time of its Upper Atmosphere Research Satellite (UARS), a 20-year-old climate satellite the size of a school bus that will fall from space sometime in the next 18 hours. NASA and the U.S. military's Space Surveillance Network still do not know exactly where the UARS satellite will fall when it hits Earth's atmosphere. Earlier this week, NASA scientists predicted that the satellite would miss North America altogether, but the space agency announced today that there is a slight chance that the 6-ton spacecraft could fall over the United States. FAA officials told pilots to keep an eye out for any fireballs or other signs of the satellite's re-entry. "In the interest of flight safety, it is critical that all pilots/flight crew members report any observed falling space debris to the appropriate [air traffic control] facility and include position, altitude, time, and direction of debris observed." Any pilots, flight crewmembers or aircraft passengers who manage to observe the UARS satellite re-entry could get a spectacular view. 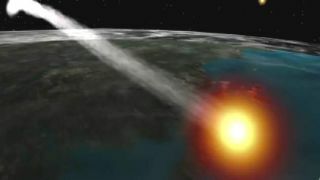 Because the satellite is so large, its fiery re-entry should be visible as a bright fireball, even in daylight. If the satellite falls over the Earth's night side, the resulting light show could be spectacular, NASA officials have said. NASA and military officials have warned the public not to touch any UARS satellite debris, should the spacecraft fall over a populated area. Instead, any debris sightings should be reported to local law enforcement authorities, NASA officials said. The UARS satellite has orbited the Earth since 1991, when it was deployed from the space shuttle Discovery by a crew of NASA astronauts. The satellite spent 14 years studying Earth's ozone layer and upper atmosphere. NASA decommissioned the satellite in 2005 after newer satellites had taken over its duties. You can follow SPACE.com Managing Editor Tariq Malik on Twitter @tariqjmalik. Follow SPACE.com for the latest in space science and exploration news on Twitter @Spacedotcomand on Facebook.